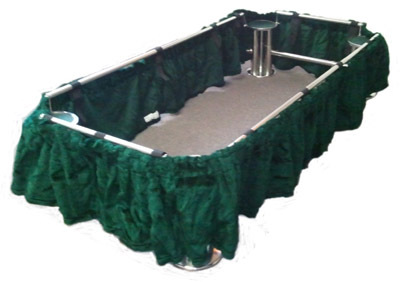 Our Casket Placer has no equal in the industry in terms of effortless casket installment, providing extra protection and support. It adjusts easily to fit all graves and can be set up in a matter of seconds. 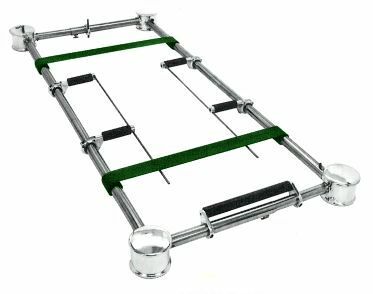 The placer arms support the casket even on steep hills and other uneven terrain. Special rubber covered ball bearing rollers assure a smooth, noiseless service, thus not disturbing the reverence of the moment. Discreet, convenient and durable, the Hepburn Superior Casket Placer has it all. 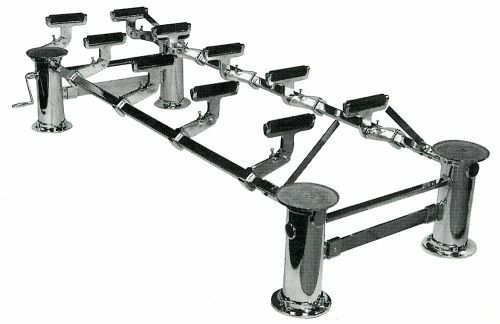 To operate the casket placer, simply rest the casket on the first two protruding rollers and slide into position. By turning the crank, the 10 supporting rollers are lowered so that the casket can be placed onto the straps of the lowering device. Adjusts quickly to fit all graves. Easy assembly and disassembly in seconds. Placer arms lock rigidly in any position to support casket. Operates independently of lowering device for extra protection. Special rubber covered ball-bearing rollers assure a smooth, noiseless service. Adjust to:......40" x 95 1/2"
Maximum Load / Weight Limit: 800 lbs. Finally, a lowering device that has workhorse characteristics with a price that will get your attention. Manufactured and sold exclusively by Hepburn Superior with a full 5 year warranty. This unit is truly master engineered and rivals "Brand X" in serviceability and trustworthiness. 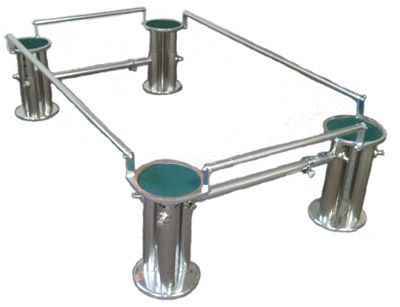 When it comes to top-of-the-line cemetery equipment, nothing compares to our Lowering Device. Designed to provide a safe, level placement of caskets into vault enclosures, this exclusive product comes complete with speed control and improved lifetime lubrication - positive lock braking system. Constructed for years of maintenance-free and dependable service, the Hepburn Superior Lowering Device is available in both Stainless Steel and Polished Chrome finishes. Also available with the device is the convenient Hepburn Superior Placer Attachment for use in holding the casket motionless even on steep, hilly terrain. Sold separately. The Hepburn Superior Lowering Device Stand provides a stable platform for your lowering device. Made of high quality square steel tubing, it adjusts in length, width and height to accommodate graveside equipment and terrain grades. Features a battle ship gray enameled finish. The unit telescopes from 62" x 25" to 94" x 38" for easy handling. Gears are large and tested to bear loads in excess of demand. A unique braking system provides a constant, steady lowering speed. Ball bearings throughout for noiseless, smooth, and fully automatic operation. Castings are of non-corrosive aluminum and easy access to all internal working parts. AVAILABLE IN FUNERAL DIRECTOR MODEL AND OVERSIZED. Rugged internal and external construction. Approximately four times the strength of the standard model. Positive breaking system assures any desired lowering speed. For easy handling, the unit telescopes from 62" x 25" to 94" x 38". A flexible transmission shaft provides smooth operation on uneven terrain. Each unit's woven straps with stand a strength of 8000 lbs. Cast aluminum heads are easily removed for access to internal working parts. Ball bearings throughout assure noiseless, easy raising and lowering and long-time service. AVAILABLE IN FUNERAL DIRECTOR MODEL AND OVERSIZED. 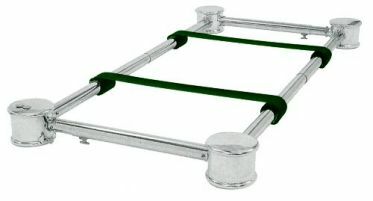 ALSO AVAILABLE LOWERING DEVICE FOR INFANT CASKETS. Stainless steel corner post with drapes.